April 14, 1960 – Mayor Richard J. Daley announces that the city will build a fixed bridge over the south branch of the Chicago River, rather than the lift bridge that it prefers. The decision comes after the federal bureau of public roads rules that federal highway funds cannot be used to pay the extra $8 million that a lift bridge would cost. 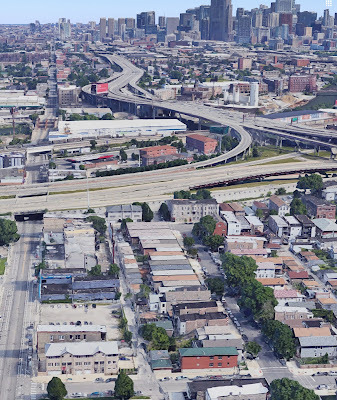 The new bridge, which today carries the Dan Ryan Expressway over the river, will instead cost about $2,600,000. The bridge will allow a clearance of 60 feet for ships using the south branch, a height that will prevent some cargo ships from reaching docks south of the bridge, another blow to commerce on the river. Thomas H. Coulter, executive officer of the Association of Commerce, says of the federal government’s decision, “This is another example of what happens to the best interests of local communities when the federal government embraces local responsibility.” [Chicago Daily Tribune, April 15, 1960] The bridge over the river is shown in the above photo. Halsted Street is the road on the left side of the picture, running form top to bottom.